Mike Daisey turns his razor-sharp wit to America's most mysterious technology icon in this hilarious and harrowing tale of pride, beauty, lust, and industrial design. He illuminates how the former CEO of Apple and his obsessions shape our lives, while following the trail all the way to China to investigate the factories where millions toil to make iPhones and iPods. Daisey's journey shines a light on our love affair with our devices and the human cost of creating them. With its 2.0 release, THE AGONY AND THE ECSTASY OF STEVE JOBS is now sharper and stronger—the New York Times called it "more powerful, funny, and engaging" than ever—and it is ethically made. 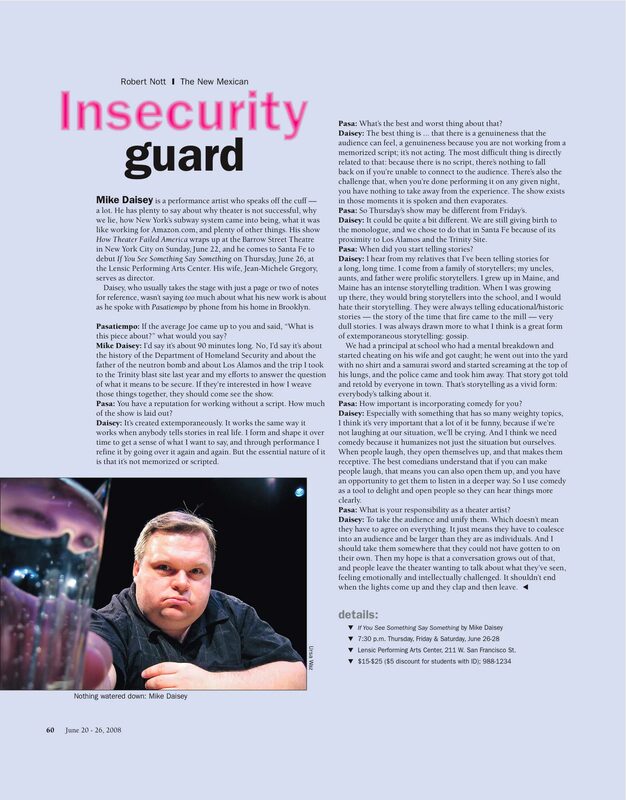 Mike Daisey has been called “the master storyteller” and “one of the finest solo performers of his generation” by the New York Times for his extemporaneous monologues. Below you'll find summaries of his twelve full-length monologues, production histories, links to reviews and more. Read the full New York Times profile on Mike and his monologues. Groundbreaking monologist Mike Daisey returns with the story of his journey to a remote South Pacific island whose people worship America and its cargo. This narrative is woven against a searing examination of the international financial crisis that gripped the globe at the same moment. Confronting the financial system that dominates our world, Daisey wrestles with the largest questions of what the collapse means, and what it can tell us about our deepest values. Part adventure story and part memoir, he explores each culture to unearth a human truth between the seemingly primitive and achingly modern. "One of the elite performers in the American theater...with an effortlessness that comes from years of spinning tales, he imbues this trip with the punch of the first explosion of an action movie." "Perfectly balances humor and genuine anger…an incredibly ballsy and humble indictment of the banking system, American materialism and the audience." "An intellectual omnivore with the theatrical authority and flair of a Gen-X Orson Welles." "One of the most daring things I've ever seen in a theatrical performance. A brilliant storyteller…hysterically funny." "A hilarious and rueful commentary on consumerism, the financial crisis and our own misplaced values. 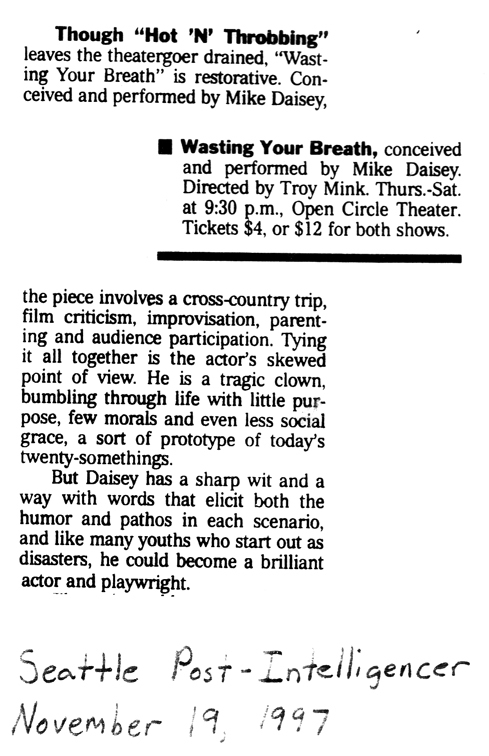 Daisey is the natural heir to Spalding Gray." "A wry, exuberant and hilarious response to the global financial meltdown—Daisey remains equal parts philosopher, historian and social critic." "Insightful and hilarious—Daisey reminds us why we go to live theater in the first place." "A seriously funny man—he makes cogent, provocative connections to reinforce his point that our hunger for money and material things is the true religion of the Western world." "Comic and searing, a form of literary standup blending autobiography, history, and philosophy." "Daisey’s stories subvert your expectations and constantly ask us to engage. He travels from comic outbursts to moments of such quiet sincerity that you can hear a dollar bill drop in the audience." "Sharp and funny. Nobody connects the dots the way Daisey does." "Daisey deftly weaves multiple narratives together in unexpected and revelatory ways that get to the heart of the question, “What is money and what is its effect on us?" 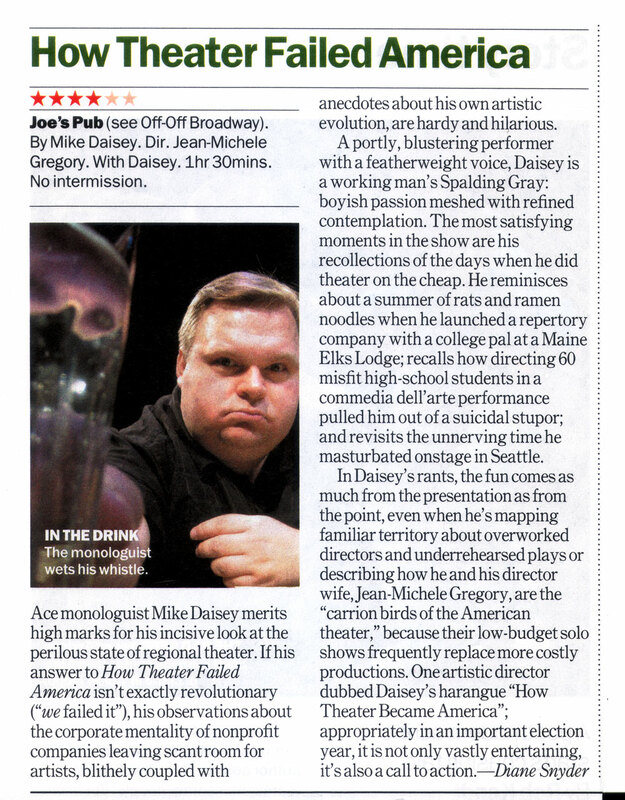 "Mike Daisey again proves that he’s the best performance artist working in the United States. His charisma, his corrosive wit, his scorn, and his mountainous anger don’t just amuse. They make you roar. And then they make you ponder. Simply put, Daisey is the best sit-down comic you’ll ever see." Listen to the Radio Times interview on NPR. Read the Time Out New York interview. Read the Time Out New York review. Read the Associated Press review. Read the Independent Weekly article. Read the Wall Street Journal interview. Listen to the Cat Radio Cafe interview. See a video interview with Mike at the On Portland site. 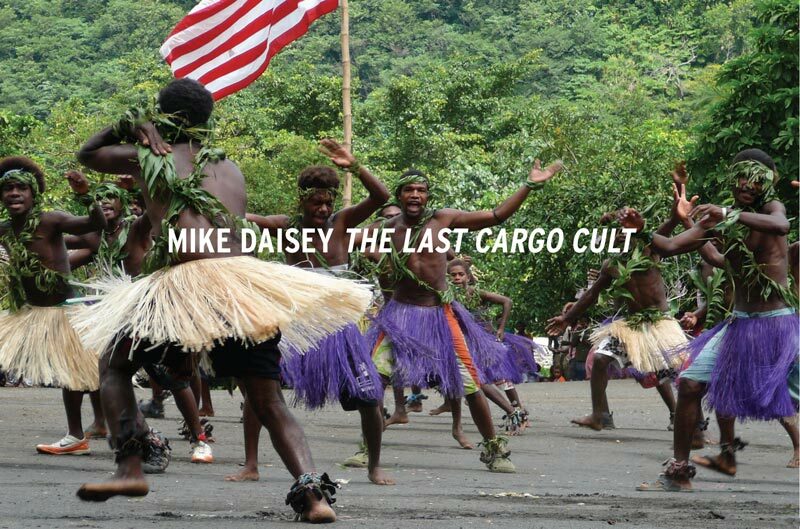 Read a Seattle Times feature on The Last Cargo Cult. Read the On Portland review. Read an article in The Stranger on The Last Cargo Cult. Read an interview at Philadelphia's Phawker.com. 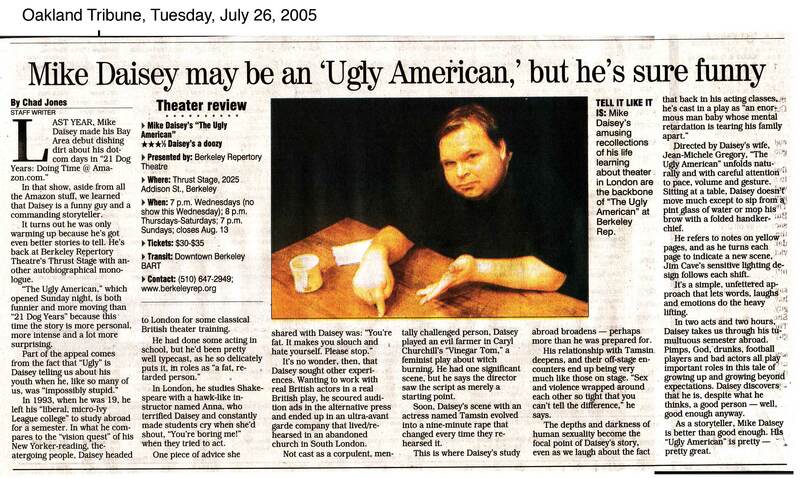 Master storyteller Mike Daisey sinks his razor-sharp wit into a subject he knows well: the American theater, from the sublimely crass to the genuinely ugly. From gorgeous new theaters standing empty as cathedrals, to “successful” working actors traveling like migrant farmhands, to an arts culture unwilling to speak or listen to its own nation, Daisey takes stock of the dystopian state of theater in America: a shrinking world with smaller audiences every year. Fearlessly implicating himself and the system he works within, Daisey seeks answers to essential and dangerous questions about the art we’re making, the legacy we leave the future, and who it is we believe we’re speaking to. "A scorched-earth critique of the dramatic world's rampant creative failure and moral hypocrisy—"How Theater Failed America" is a funny, surprisingly supple performance about life in the theater, the ecstatic highs and the aching, humiliating lows, rendered here with explosive humor and a dark edge of tragedy." "A sardonic rebuke to the corporate types who hold American theater hostage and a powerful sense of the wonder of theater. A remarkable performer." "Blending political anger with striking personal stories, this piece should reach anyone who believes in live performance." 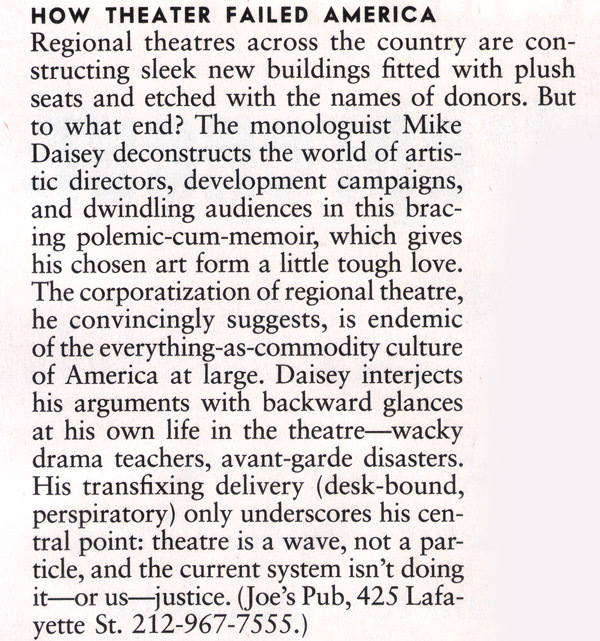 "Daisey is a working man's Spalding Gray: boyish passion meshed with refined contemplation...not only vastly entertaining, it's also a call to action." "His transfixing delivery underscores his central point: theatre is a wave, not a particle, and the current system isn't doing it—or us—justice." "A rollicking, entertaining evening that's as inspiring as it is cautionary." 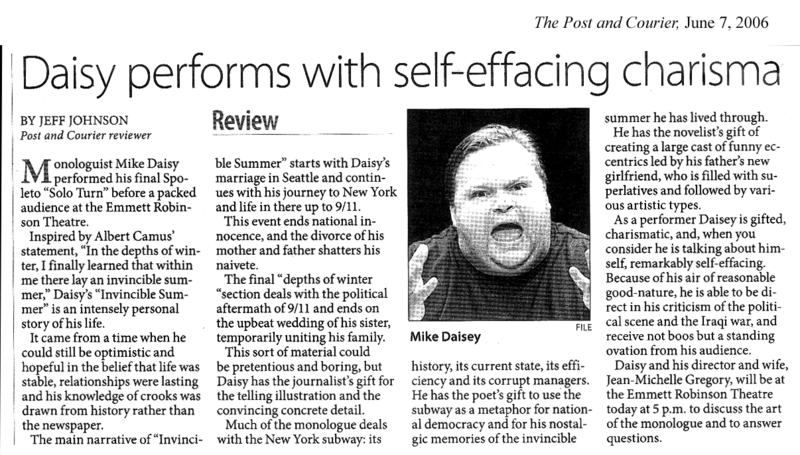 "It's an exhilarating show, as Daisey deftly coaxes the room from raucous laughter to hushed contemplation...Daisey has a knack for disarming his audience with an approachable persona, incandescent wit and a gift for virtuoso storytelling." "Daisey creates an alternately exhilarating and frightening picture of the contemporary American stage—a startlingly accurate diagnosis of its condition"
"Though theater may have failed, Daisey nicely succeeds." "Wildly funny and a passionately engaged critique—it will remind you of everything you once thought possible and make you wonder whether it can't be possible still." "An engaging, witty, and impassioned critique of what's wrong with the way theater is currently being done -- and who is responsible. He manages to make the audience understand the weight of everything he's saying while transforming the material into some of the funniest stories I've ever heard. At the heart of all of his tales is an element of truth that makes clear not only his critical opinions, but also his love for the art." "Pungent, profane and hilarious...Daisey can evoke the thrill and absurdity of theatrical passion with the surreal bravado of a modern-day Swift." 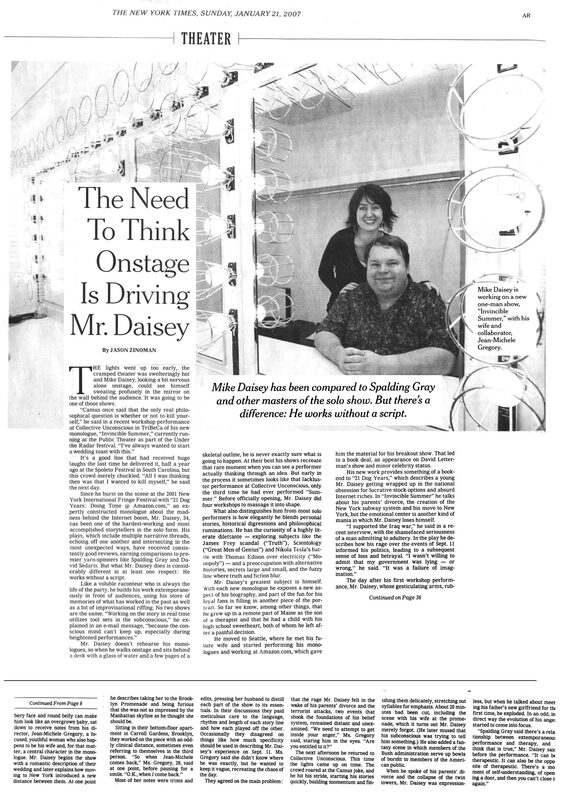 "No matter how much vitriol is spilled, Daisey can do so without raising rancor in the hearts of his targets...How Theater Failed America sounds like career suicide. But if anyone can pull it off, it will be Mike Daisey." "As a theatre artist whose work demonstrates one way in which the theatre has a unique power to criticize the culture at large, he's uniquely positioned to offer a devastating criticism." How Theater Failed America has appeared at the Public Theater in the Under The Radar festival, in Seattle at the Capitol Hill Arts Center, in a subsequent sold-out five week engagement at Joe's Pub, after which it transferred Off-Broadway to run at the Barrow Street Theatre. It will next be performed in Washington DC, Los Angeles, and Chicago in 2009. Read the feature in the American Prospect. Read the Washington City Paper review. Read the New York Times feature on the show. Read the Washington Times review. Read the Village Voice review. Read the Stage & Cinema review. Read the Edge New York review. Listen to the first scene of How Theater Failed America. Listen to an interview on the Leonard Jacobs show with Mike. Listen to an interview with Mike about PRI's FAIR GAME. Read a feature in the Seattle Times. 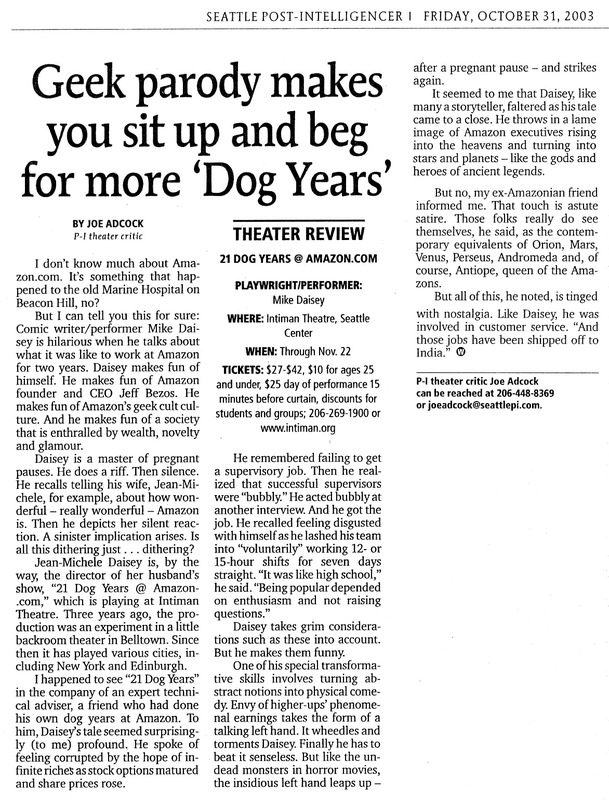 Read about How Theater Failed America in the Seattle Weekly. Read THE EMPTY SPACES, an essay by Mike on the state of theater, in The Stranger. 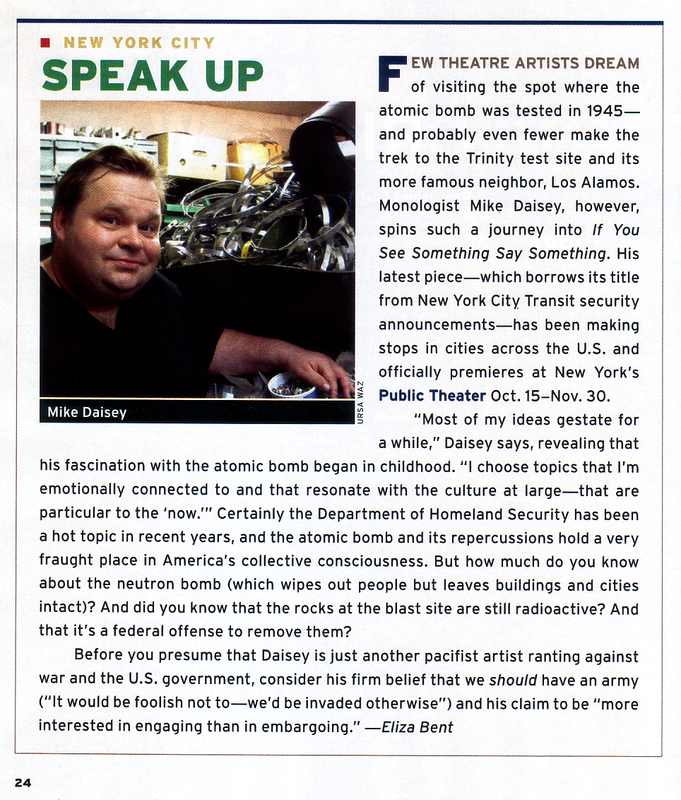 In this groundbreaking monologue, Mike Daisey tackles a story at the heart of our world today: the surprising, secret history of the Department of Homeland Security. This is woven together with the untold story of the father of the neutron bomb—called “the perfect capitalist weapon” for the way it kills civilians while leaving cities and industries intact—and a pilgrimage to the Trinity blast site, where atomic fire rewrote history a half a century ago and ushered in an age of American supremacy. Combining damning fact and searing personal history, Daisey takes us on a journey through the dark heart of America, in search of answers for what it means to be secure, and the price we are willing to pay for it. "Ambitious, persuasive and provocative—Mr. Daisey is as much a performer as a raconteur. Funny, shrewd and continually absorbing." 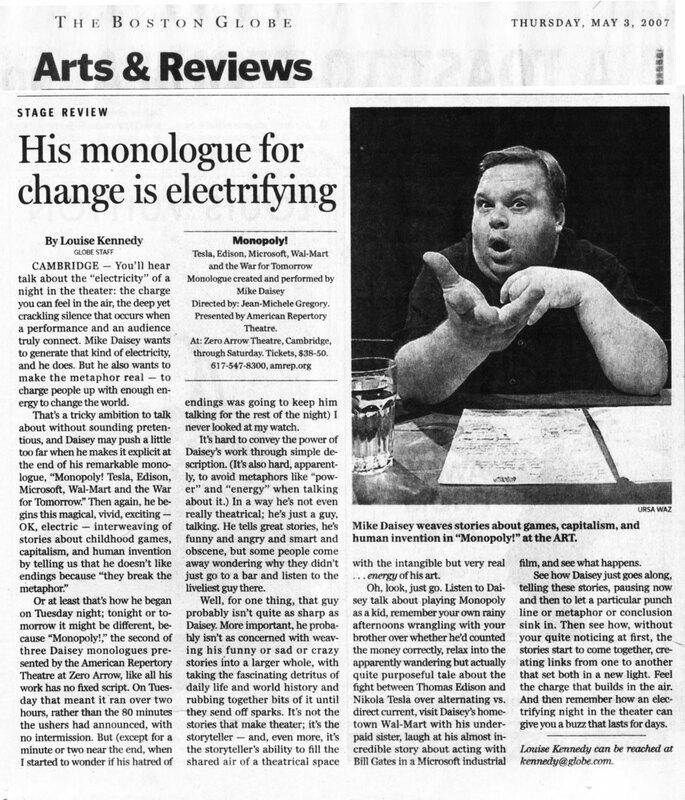 "Once again, Mike Daisey has proven himself that rare theatrical creature: an entertaining performer with something valuable to say. A gripping, vital story." “Daisey has a masterful command of his art—he is all-powerful. When he wants you to laugh, you laugh; when he wants you to think, you think. He doesn't draw you into the deftly woven stories he tells—rather, he shows how, unawares, you have been part of them all along." "Mesmerizing—Daisey draws an Everyman's history of the military-industrial complex from his well of wrath." "This master story-spinner has created a finely tuned fury—funny, provocative and even poetic." "A very literate, richly researched and frequently very funny show—a monologuist who always threatens to burst out of his chosen form, with a keen and snarky satirical ear for the ironies and contradictions of the American cultural-political-industrial complex." "Highly entertaining—freewheeling, free-associative, and thought-provoking." "Searingly intelligent and funny—Daisey ties everything together in a graceful, epic sweep that leaves you pondering whether the impulse to annihilate is bred in the bone - and whether vulnerability is a liability or simply the essence of what it means to be human." "A biting analysis sounding the alarm against everything that should scare us about homeland security." "There is nothing minimalist about this monologist—if Lenny Bruce was embodied by Zero Mostel and played by Louis Armstrong, the result would closely resemble Mike Daisey." "Mesmerizing and raucous—a funhouse ride worthy of Dr. Strangelove." 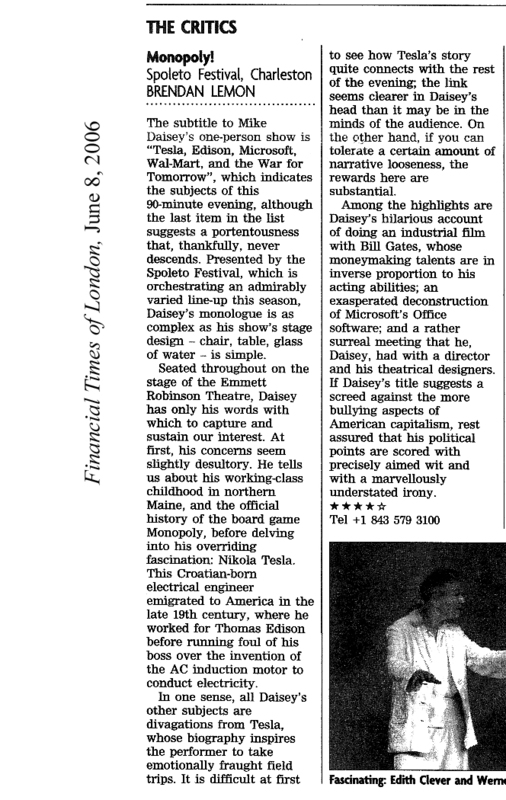 "Daisey is a hellish bad boy—entertaining and disturbing—a sharply humorous commentary on our troubled times." "A riveting stage presence—his comic timing is honed to a fine, sharp point. He deals in hard truth with such humor and energy you forget what he's saying is piecing you like a needle." "Breathtaking—one of the most important shows of the year, if not the most important. Daisey's dazzling new monologue is one of the most exciting evenings of theatre one can have right now." "A provocative and entertaining examination of post-9/11 America, and the language of security that defines it." "He’s accomplished that rarest of feats: mixing rage and a revolutionary spirit with a well-grounded intelligence and an ability to promote discussion, maybe even solid changes." "Daisey distills vast sources of disparate knowledge, delivered with scathing anger, humor and a sort of gentle wisdom. He’s the History Channel, the best of public radio, and the most entertaining guy at the bar — but much, much better." "A scathing and hilarious critique of today's War on Terror. Leaves the audience in gut-busting laughter with the residual "gawd, this is so fucked up" feeling that permeates the entire show—Daisey keeps you captivated with his weaving narrative and brilliant insights." "Exquisitely conceived and obsessively researched." "Who knew that traipsing through the past six decades of America's security culture could be so engrossing? Listen to a master storyteller show how to condense, edit and sift away all that could be used into a potent script of frightening issues and provocative analysis, punched up with perfectly pin-pointed delivery." "Never any less than fascinating: cutting, humorous, and immensely provocative." 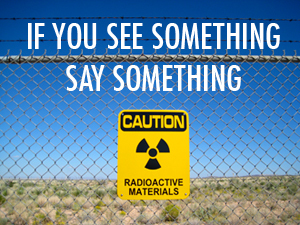 If You See Something Say Something was first performed at the Lensic Performing Arts Center in Santa Fe before its premiere at Woolly Mammoth Theater in Washington DC. From there it appeared at the TBA Festival in Portland, Oregon and the Museum of Contemporary Art in Chicago before running at the Public Theater in their 2008/9 season. Read the New York Post review. Read the Bloomberg News review. 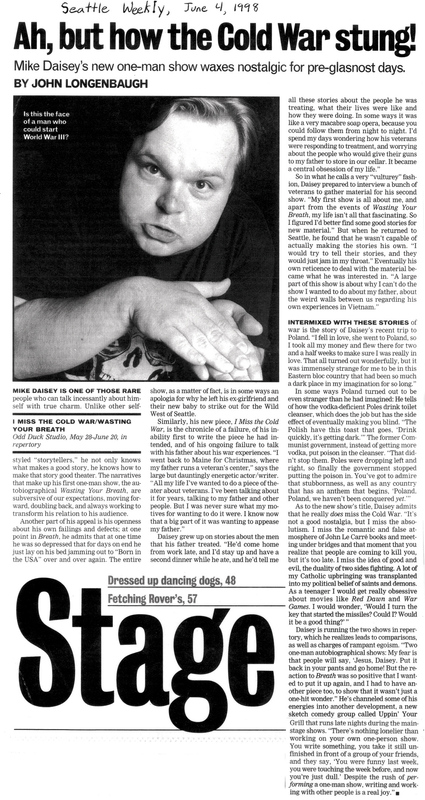 Read the Portland Mercury review. Read the Broadway World review. Read the New York Post feature. Read the American Theatre preview. 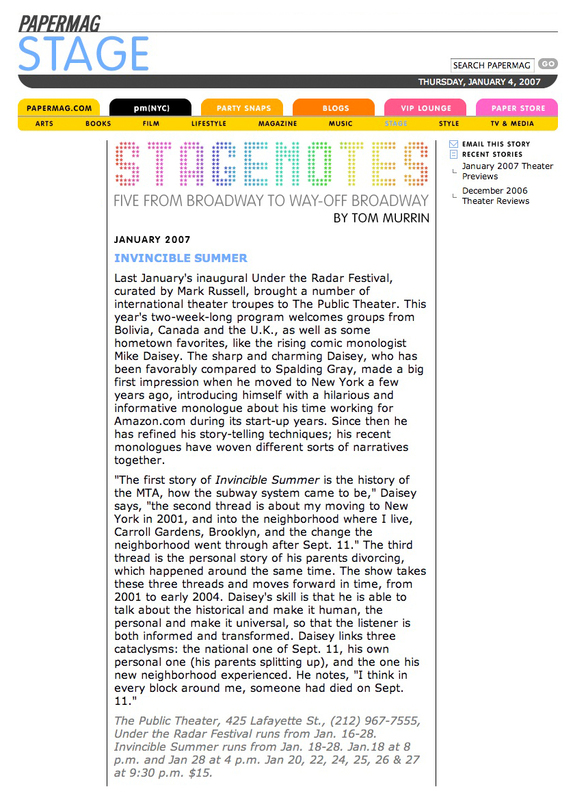 Read the American Theater Web review. Listen to the WNYC feature. Listen to the Santa Fe Radio Cafe interview. Read the Chicago Tribune preview. Read the TimeOut Chicago interview. Read the Portland Tribune preview. Read a review in DCist. Listen to an interview with Mike on XM Radio's Left Jab. Read a Washington Post article about Mike's run-in with the TSA. Read a feature in the Washington Post about the show. Read an interview with Mike on the show in the New Mexican magazine. Read the review in Washington City Paper. Listen to an interview with Mike on NPR's Performance New Mexico. 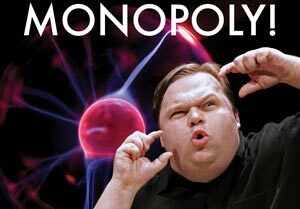 In this devastating monologue about monopoly and its discontents, Mike Daisey explores the warped genius of inventor Nikola Tesla and his war with Thomas Edison over electricity—alternating current versus direct current—a battle that etched itself into the streets of New York City itself. 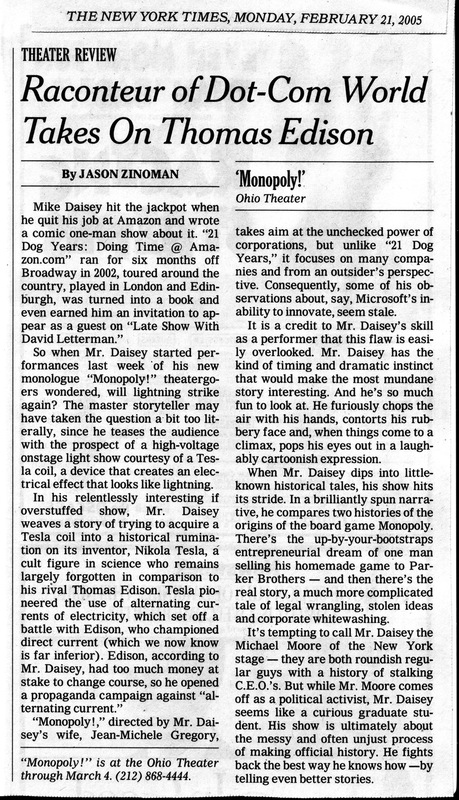 This thread loops and whorls around Microsoft’s historic antitrust lawsuit, the secret history of the board game Monopoly, and ultimately the story of Daisey’s hometown and its one remaining retailer: Wal-Mart. As subversive as it is hilarious, Monopoly! illuminates the issues we confront under corporate rule, and explores the choices and struggles individuals face living in a system that recognizes only profit and loss. "Layering outrage, official and underground history, personal memoir and rollicking humor, Daisey makes you think, feel and question. And he makes you laugh — hearty laughter, cathartic and barbed. Spellbinding." "Monopoly is the work of a true writer, an inspiring and compassionate activist, and a relentlessly curious historian—a rich tapestry of historical research, personal memoir, and social commentary that creates the illusion of past and present, of timelessness." Monopoly! has been performed at full productions at the 2005 Spoleto Festival, American Repertory Theatre, the Ohio Theatre (with Les Freres Corbusier), Capitol Hill Arts Center, the Bumbershoot Arts Festival and the Noorderzon Festival in the Netherlands after receiving workshops at Manhattan Theatre Club, Berkeley Repertory Theatre and Portland Stage Company. Read the Financial Times of London review. Read the Seattle Times feature. Read the Portland Tribune interview. Read the Portland Tribune TBA review. Read the Seattle Post Intelligencer review. Read Mike's essay on his adventures with a Tesla coil at Slate. Listen to an interview with Mike about Microsoft on National Public Radio. 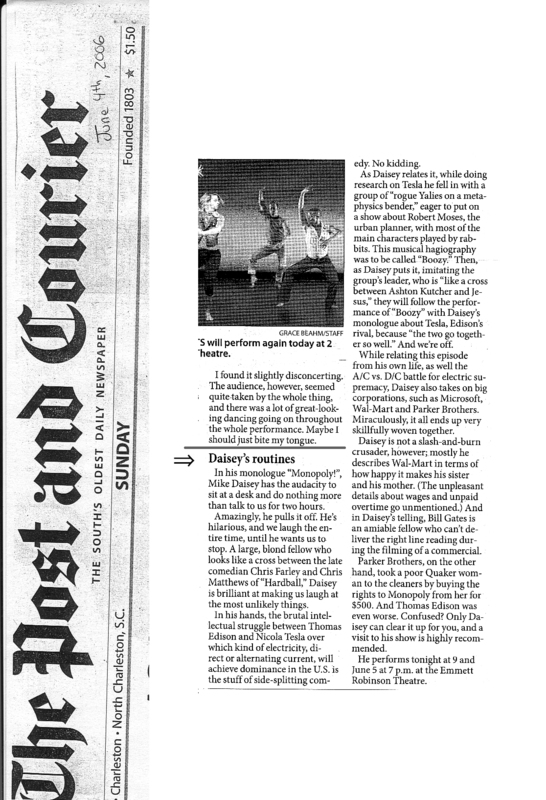 Read a review of the show in the Charleston Post and Courier. Read the Seattle SPI review. View a short film of Mike at Wardenclyffe, the site of Tesla's laboratory. Read an interview with Mike about Monopoly at Seattlest. Monologuist Mike Daisey presents a dazzling new work: four “bio-logues” about megalomania and desire constructed from the interleaved life stories of Bertolt Brecht, P.T. Barnum, Nikola Tesla and L. Ron Hubbard. 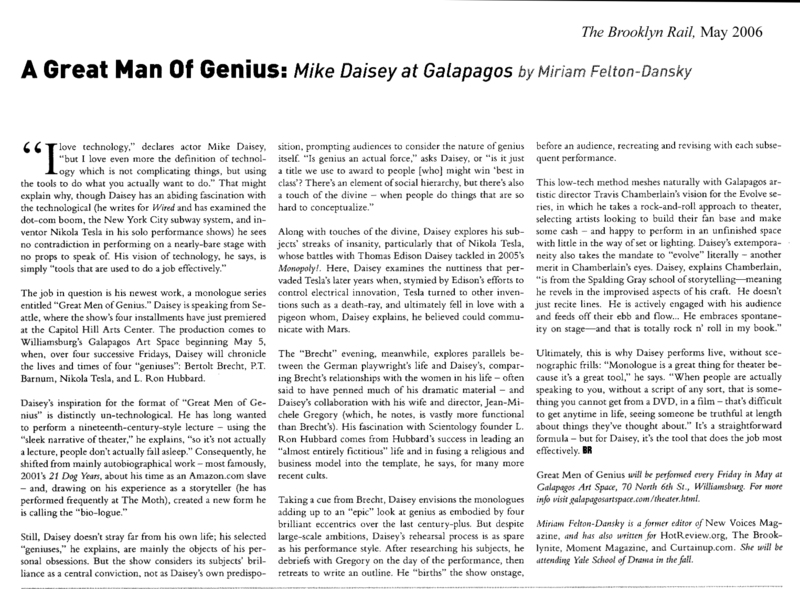 Over four nights Daisey explores the nature of genius and wrestles with the pride, insanity and chauvinism that bind these men together, and reveals how the heights and depths of their gifts have much to teach us about ourselves. Each evening is unique and can be viewed independently, but all four together form an epic oral accounting of triumph and folly told with Daisey’s dark and hilarious intensity. P.T. Barnum ~ gifted entrepreneur, showman, raconteur, hoaxster, freakshow and circus promoter who changed the face of nineteenth century America through blatant, shameless lying. Bertolt Brecht ~ playwright, poet, lover of women and certifiable cad who escaped Nazi Germany, sympathized with the Communists, failed in Hollywood, was persecuted by McCarthy, and redefined world theater. Nikola Tesla ~ mad genius, brilliant scientist and visionary who sparred with Thomas Edison and died insane and penniless writing love sonnets to pigeons after bringing the world electricity as we know it. L. Ron Hubbard ~ bigamist, occultist, and charismatic science fiction author-turned-guru who took 1950's popular psychiatry by storm and went on to create the Church of Scientology: the most celebrity-driven and litigious organization on Earth. Just once, it'd be nice to see Mike Daisey and Garrison Keillor trade places, not so much to hear Keillor's nostalgically mellow take on Daisey's world, but to see Daisey rip the lid off Lake Wobegon and expose its wicked underbelly. For, you see, Daisey is very much the dark doppelganger of Keillor's soul. He is a Keillor for the seriously perverse. He is a mesmerizing performer who spins words into comic and emotional gold, revealing as much about himself as the subjects he is discussing. "Great Men" is big-time brain candy that takes a while to digest. It's a colossally gutsy project that takes the whole medium-is-the-message thing seriously as Daisey slaps the convention of the short and tight solo genre upside the head. He seeks to work on the same ultra-ambitious scale as the great men he chronicles in these birth-to-death sagas. Rest assured, he also has a gift for zapping the zeitgeist, and he knows all too well that ADD is the spirit of our age. So seeing these shows as stand-alone solos would be cheating yourself of one of the cheekiest theatrical adventures in recent memory. A long day's story into night. The result isn't just highly entertaining--it's also bracingly honest and affecting. Daisey and Gregory abandon the regular alternation between biography and autobiography, and heighten the intimacy of the first-person story to a disturbing, even chilling degree. Gripping tales...hilarious, nuanced and wide-ranging runimations...Daisey manages to be even more fascinating. Four addictive monologues on noteworthy men. Daisey is a powerful, hilarious, touching monologist. His face is an elastic ball of expressiveness. He has a great way of building each segment of his story to a climax. He makes us laugh. There's also something very gentle about him too. He never takes the obvious route with his stories or goes for the predictable laugh. 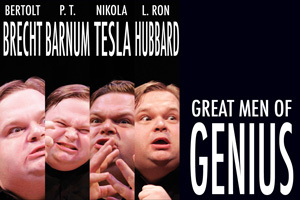 His take on each of the four "geniuses" on the program - Tesla, Brecht, Barnum, and Hubbbard - made me wish I'd had him as a history teacher at high school. Instead of making obvious links between the historical subject and the details of his own life, Daisey allows us to draw our own conclusions. This is subtle and sublime. Daisey is a master showman, combining the storytelling acumen of David Sedaris and Lewis Black’s outraged humor. 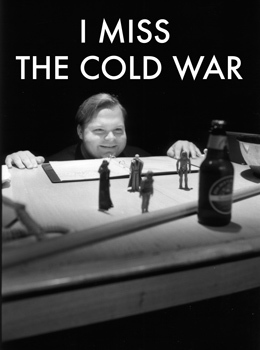 This is one five-hour monologue, broken up into four segments, wherein the true genius of the piece, Mike Daisey, interweaves vignettes from his life with the excerpted life stories of those famous men. He paints for us not only pictures of who these men were, but also of himself, and, by association, how the productivity and madness of genius can be expressed in our own lives. The ultimate result is a vivid and detailed portrait of the nature of megalomania and success. Get tickets for one of the remaining Sunday marathons before this unique theatrical experience sells out. Like a coked-up History Channel biography, Mike Daisey’s new ‘bio-logues’ ruminate on brilliant men and their piteous pitfalls, interspersed with Daisey’s personal experiences. Each night explores a new subject, from Bertolt Brecht to L. Ron Hubbard—it’s like hearing a lecture by your favorite professor while drinking beer in a comfortable lounge chair. You might even walk away smarter than before. An interestingly unpredictable and uneasy moosh of homage and parody…a kind of dual Rorschach test, in which one man identifies his own demons and ideals in the ink-blot of another’s life story. You get the feeling that Daisey is coming to new conclusions and realizations all the time, right there on stage—that his delving into the minds of these men is never complete, and that it’s deepening before your eyes…it’s an exciting process to watch. 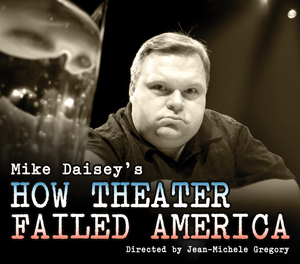 Engaging and funny, Mike Daisey’s monologues brim with subtle messages that never hammer you over the head...by association, he adds himself to the titular category. Great Men of Genius has received productions at the Public Theater in New York City, Berkeley Repertory Theatre, the Galapagos Arts Center in New York, and the Capitol Hill Arts Center in Seattle. 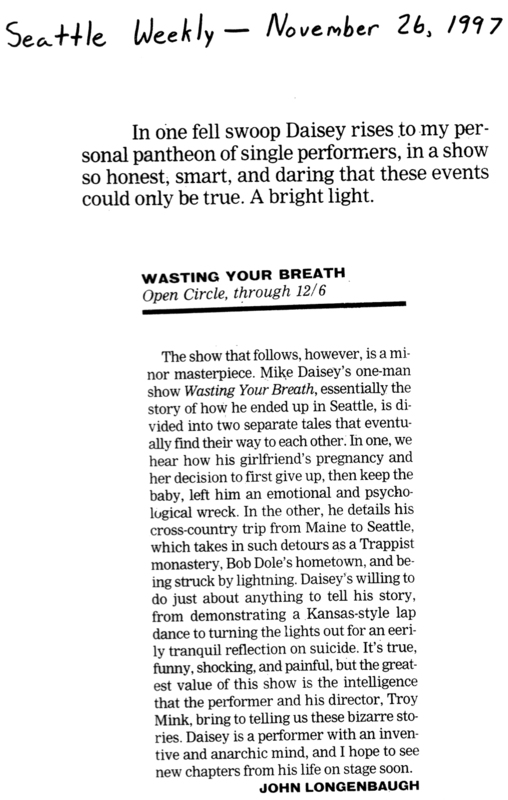 Read the Seattle Post-Intelligencer review. 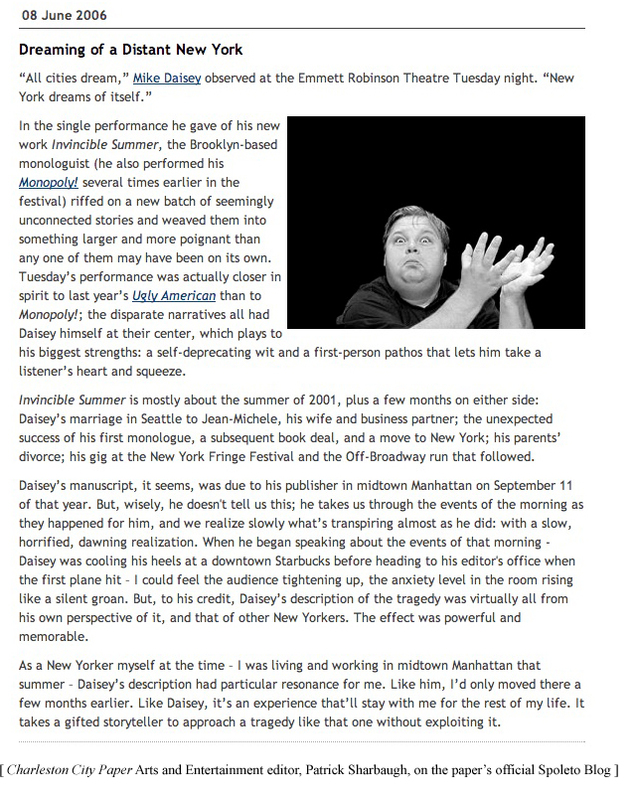 Mike Daisey tells his story of the last glorious summer before everything changed. Starting with the bizarre history of the Manhattan Transit Authority’s epic subway system, Daisey maps New York City from the bottom up--a city so unbelievable it could only be true—and paints a picture of his Brooklyn neighborhood before and after 9/11 that captures the personal and social shockwaves of that terrible day. By setting the intensely personal story of a family in crisis against the backdrop of massive social change, Daisey tells a story of loss and faith for our time. Weddings and wars, fathers and sons, governments and citizens clash--and the world comes crashing down, leaving serious questions in its wake: What does it mean to belong to a place, and how will we hold on when we lose our way? Daisey radiates heat like the fiery orb of New York’s dreaded summer sun. His delivery can be acerbic, his voice and inflection taking on a distinct Lewis Black edge; in his calmer moments, Daisey sounds more like Garrison Keillor, as he zeroes in - implacably, with perfect deadpan control of his colorful vocabulary - on his pitch-perfect payoffs. Invincible Summer has been performed at the Public Theater, American Repertory Theatre, Yale Repertory Theatre, the 2006 Spoleto Festival and ACT Theatre in Seattle. Read the New York Times feature on INVINCIBLE SUMMER. Listen to an interview and excerpt from INVINCIBLE SUMMER on Public Radio International's FAIR GAME. Read the Paper Magazine preview piece. INVINCIBLE SUMMER is New York Magazine's top pick of the Under The Radar Festival. 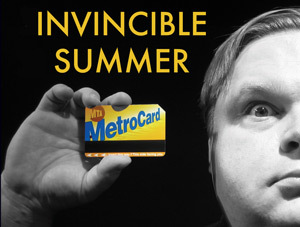 Read a review of INVINCIBLE SUMMER at Theatermania. Read a review of INVINCIBLE SUMMER in The Villager. Read an interview with Mike about INVINCIBLE SUMMER and his work at Gothamist. 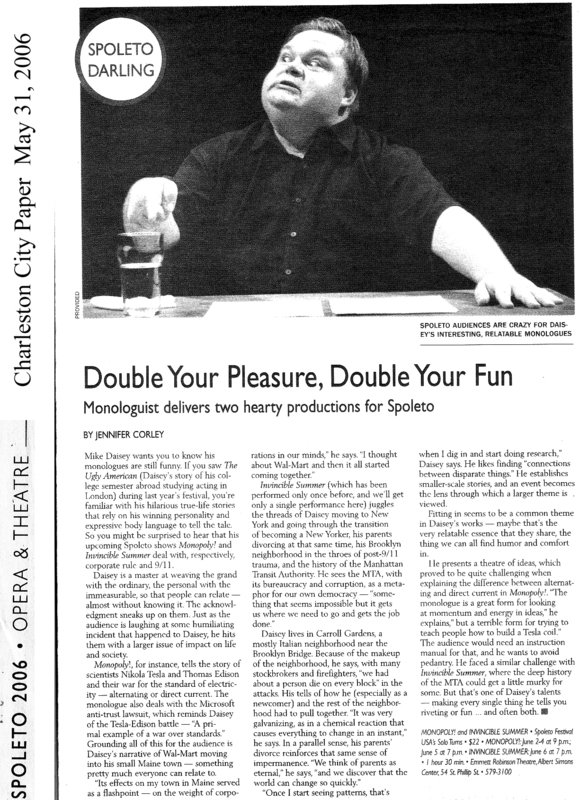 Read the Charleston City Paper review. Read an excerpt/essay from of Invincible Summer in The Stranger. Read the Charleston Post and Courier review. Read an article on the show in the Charleston City Paper. TRUTH follows the fictional and nonfictional stories of James Frey's (author of A Million Little Pieces) self-destruction, the sordid and shocking tale of J.T. LeRoy, (The Heart Is Deceitful Above All Things) a world-famous transsexual author whom the world learned ultimately didn't exist, and Fernando Pessoa, a Portuguese poet whose great works were written by warring multiple personalities inside his head. These stories are reflected against an autobiographical accounting of Daisey's own history of lying and telling the truth in an attempt to illuminate the uncertain landscape of the emotionally true, the literally true, and the constant struggle to speak the truth. TRUTH has been performed Off-Broadway at Ars Nova in New York City. 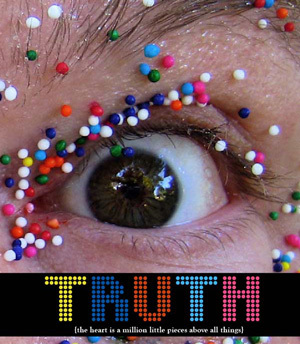 Read a Q&A at Maud Newton's literary blog about TRUTH. Watch a video statement from Mike about James Frey. Watch a video statement from Mike about J.T. LeRoy. Mike Daisey’s latest monologue is a two-headed tale of love and loss with the unlikeliest of subjects—a small black dog. 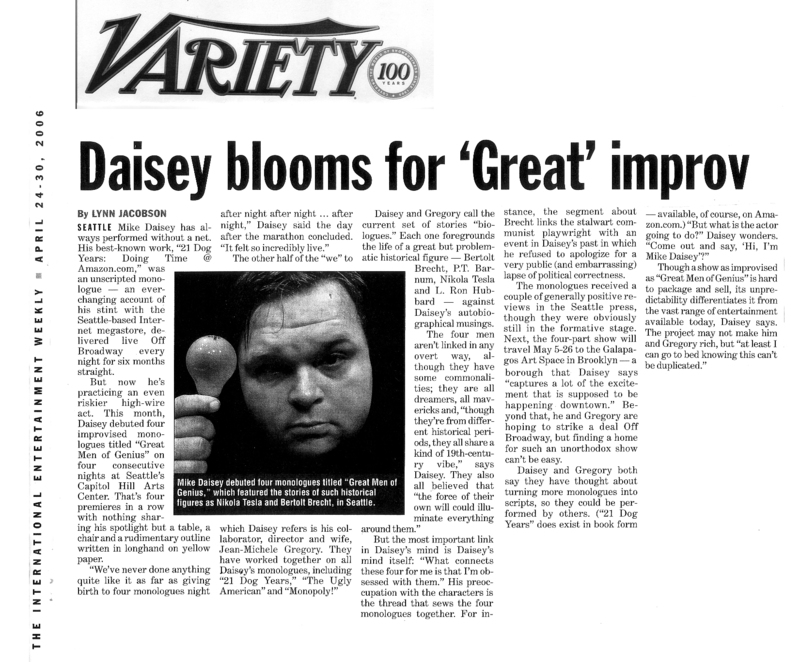 Over the last decade, Daisey has brought his brand of fierce storytelling to theaters across the country and overseas and has been called “the master storyteller” and “one of the finest solo performers of his generation” by the New York Times. Now he explores the difficult decisions we all face when bringing new life into the world through the story of two would-be parents raising a puppy to adulthood. From housebreaking to obedience classes to family planning, Tongues Will Wag illuminates the most difficult questions with honesty, humor, and bracing candor. 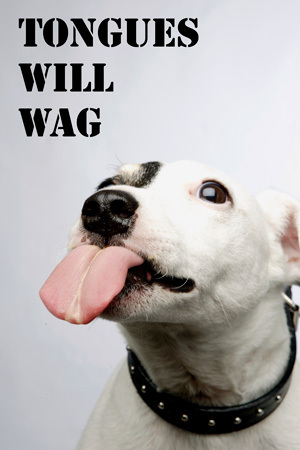 Tongues Will Wag has appeared at American Repertory Theatre, Berkeley Repertory Theatre, Ars Nova, Redhouse Arts Center and the Cape Cod Theatre Project. 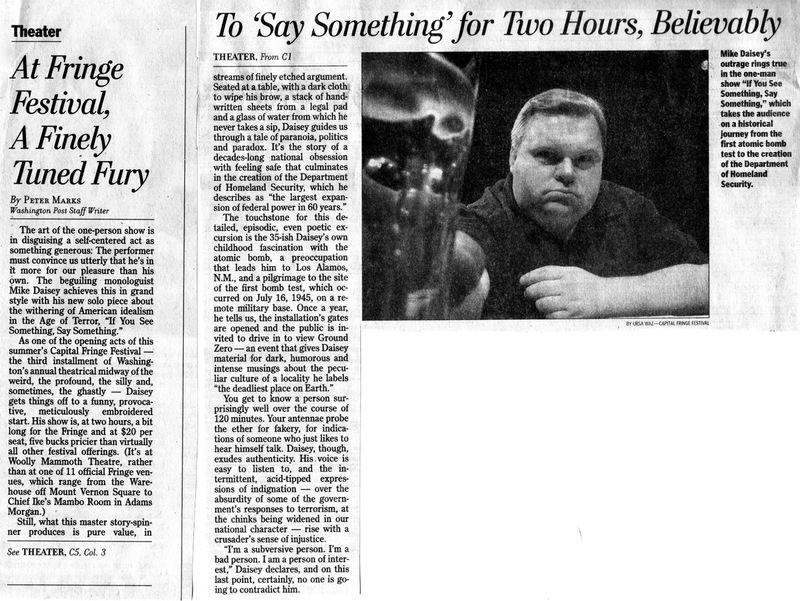 At the age of 19, Mike Daisey went to London to study theater at the feet of Gielgud, Olivier, and other important-sounding, possibly dead, white men. He instead falls in with a postmodern, neo-feminist performance troupe that creates idiosyncratic shows in an abandoned church south of the Thames. When he falls in love with an actress who is, unbeknownst to him, a member of the world’s oldest profession, his misadventures have just begun. In The Ugly American, Daisey provides a startling window into an unforgettable education. From serving tea to Tom Stoppard to driving drunk with his girlfriend’s pimp, he weaves together the lessons of artifice, class, gender and power that both worlds so violently taught him. 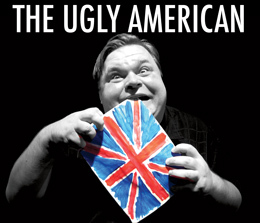 The Ugly American has received workshops at Intiman Theatre, Manhattan Theatre Club, Ars Nova and the Cape Cod Theatre Project before going on to full productions at the Spoleto Festival, ACT Theatre, and Berkeley Repertory Theatre. 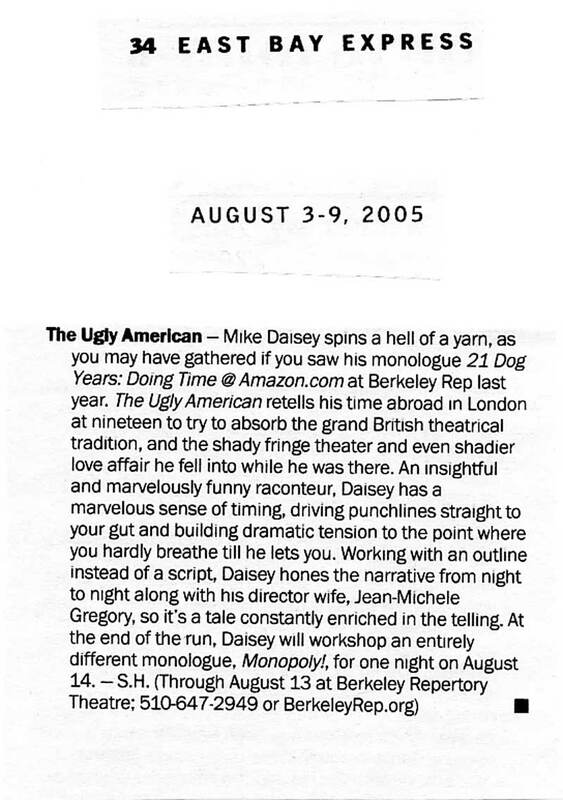 An adaptation of The Ugly American was recorded for BBC's Radio Four and aired in 2005. View an excerpt from The Ugly American. Read the Seattle Weekly review. Read the Oakland Tribune review. Read Mike's essay in The Stranger about The Ugly American. Read the East Bay Express review. Boy meets dot-com, boy falls for dot-com, boy flees dot-com in horror. So goes one of the most perversely hilarious love stories ever told, one that blends tech culture, hero worship, cat litter, venture capitalism, and free bagels into a surreal cocktail of delusion. 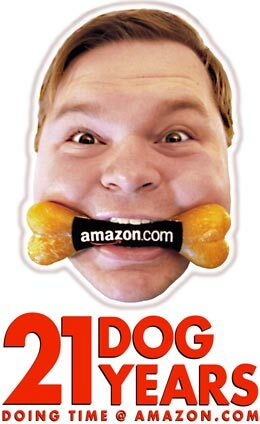 In 1998, when Amazon.com went to temp agencies to recruit people, they gave them a simple directive: send us your freaks. 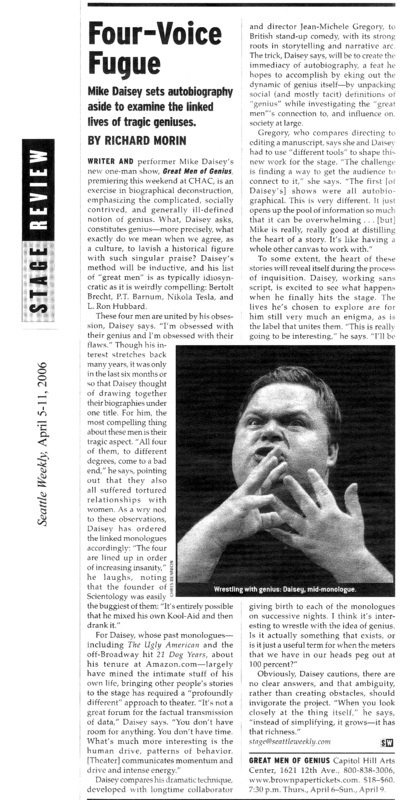 Mike Daisey—slacker, onetime aesthetics major, dilettante—seemed perfect for the job. His ascension from lowly temp to customer service rep to business development hustler is the stuff of both dreams and nightmares. With lunatic precision, Daisey describes the lightless cube farms in which book orders were scrawled on Post-its while technicians struggled to bring computers back online; the fourteen-hour days fueled by caffeine, fanaticism, and illicit day-trading from office desks made from doors; his strange compulsion to send free books to Norwegians; and the fevered insistence of BizDev higher-ups that the perfect business partner was Pets.com—the now-extinct company that spent all its assets on a sock puppet. 21 Dog Years is an epic story of greed, self-deception, and heartbreak, a wickedly funny anthem to an era of bounteous stock options and boundless insanity. With keen observation and honesty, Daisey explores the darkly humorous compromises made every day to survive in corporate America. 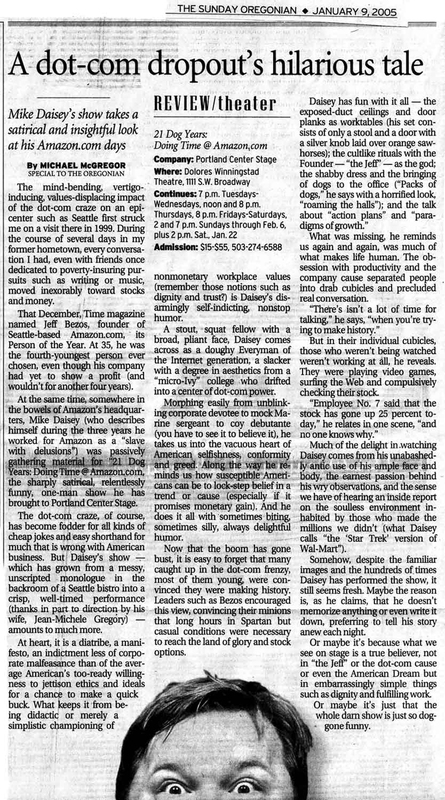 21 Dog Years began in Seattle’s Speakeasy Backroom in February of 2001, where it received the attention of media outlets big and small, from South African Public Radio to Entertainment Weekly to David Letterman. 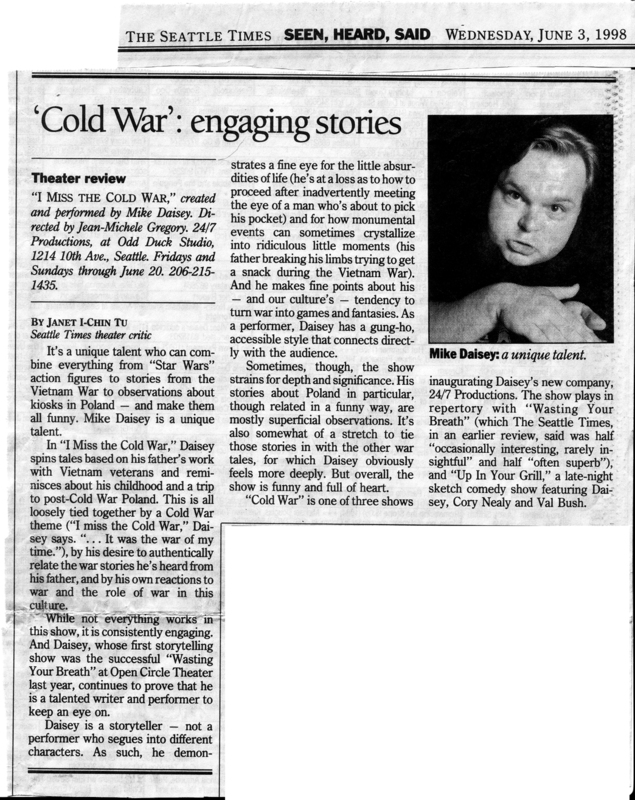 Daisey then took the show Off-Broadway where it played for six months at the Cherry Lane Theatre before going to the Edinburgh Fringe Festival, Intiman Theatre, Berkeley Repertory Theatre, Portland Center Stage, and numerous one-night engagements across this great planet. In 2002, the Free Press (imprint of Simon & Schuster) published Daisey’s book version of the tale under the same name, and in 2004 the BBC aired Daisey’s radio adaptation of his monologue on Radio Four. Watch the David Letterman interview. Listen to Mike on Weekend Edition. Listen to Mike on the Todd Mundt Show. Read the first chapter of 21 Dog Years. Buy the book at Powells. 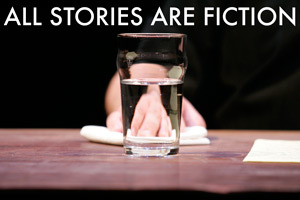 All Stories Are Fiction premiered at Performance Space 122 where Daisey performed new shows every Monday night for two seasons in 2004 and 2005; some of these performances are available for listening at Audible.com. Theaters that have produced Stories include ACT Theatre, Portland Center Stage, the Maui Cultural Arts Center and the Capitol Hill Arts Center; colleges that have hosted Stories include University of Puget Sound and Colby College. #17: ELECTRICITY: FRIEND OR FOE? In this hilariously dark vision of the Great American Roadtrip, Daisey is crossing the country from Maine to Seattle or bust in a story that jumps back and forth between two autobiographical storylines: a crumbling relationship with a pregnant girlfriend and a cross-country exodus from New England. As he flees his old life he finds himself in a Trappist monastery in Kentucky, struck by lightning in Nevada, stealing jewelry in New Jersey, and visiting the final resting place of Marilyn Monroe in California. Half comedy and half confession, Daisey's shocking and relentless first monologue cuts to the heart and refuses to let go without a full accounting. 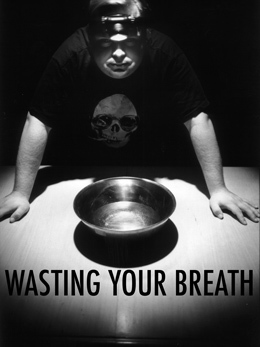 Originally produced by Open Circle Theater in Seattle in 1997, Wasting Your Breath was remounted at Berkeley Repertory Theater in 2004. In 1997 Mike spent all the money he had in the world to fly to Poland to win the heart of a girl. In 1990 he was a high school senior who argued viciously for the destruction of the Warsaw Pact while its factions were weak. In 1983 he was ten years old and spent every night waiting for a nuclear warhead to detonate over his home. In 1971 his father was fighting in Vietnam, and later would return to become a counselor to other veterans. Using interviews with veterans from his father's clinic and his own experience of sudden immersion in post-Cold War Warsaw, Daisey tells a story of expectations and our own blind alleys. Originally produced by 24/7 Productions in Seattle in 1998. Read the Seattle Weekly preview.